The 1993 United States federal budget is the United States federal budget to fund government operations for the fiscal year 1993, which was October 1992 – September 1993. 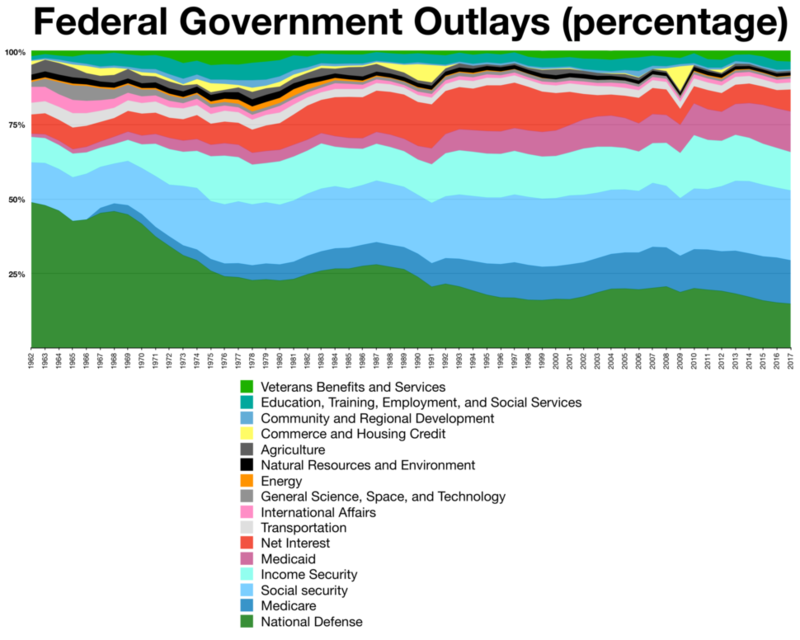 This budget was the final federal budget submitted by George H.W. Bush before he was defeated by Bill Clinton in the United States presidential election, 1992. The 1994 United States federal budget is the United States federal budget to fund government operations for the fiscal year 1994, which was October 1993 – September 1994. This budget was the first federal budget submitted by Bill Clinton. The 1995 United States federal budget is the United States federal budget to fund government operations for the fiscal year 1995, which was October 1994 – September 1995. This budget was the last to be submitted before the Republican Revolution in the 1994 midterm elections. The first shut down occurred after Clinton vetoed the spending bill the Republican-controlled Congress sent him, as Clinton opposed the budget cuts favored by Speaker of the House Newt Gingrich and other Republicans. The first budget shutdown ended after Congress passed a temporary budget bill, but the government shut down again after Republicans and Democrats were unable to agree on a long-term budget bill. The second shutdown ended with congressional Republicans accepting Clinton's budget proposal. The first of the two shutdowns caused the furlough of about 800,000 workers, while the second caused about 284,000 workers to be furloughed.Polling generally showed that most respondents blamed congressional Republicans for the shutdowns, and Clinton's handling of the shutdowns may have bolstered his ultimately successful campaign in the 1996 presidential election. The second of the two shutdowns was the longest government shutdown in U.S. history until the 2018–2019 government shutdown surpassed it in January 2019. The United States Federal Budget for Fiscal Year 1997, was a spending request by President Bill Clinton to fund government operations for October 1996-September 1997. Figures shown in the spending request do not reflect the actual appropriations for Fiscal Year 1997, which must be authorized by Congress. The requested budget was submitted to Congress on February 5, 1996. The Budget of the United States Government Fiscal Year 1999 (FY99) was a spending request by President Bill Clinton to fund government operations for October 1998–September 1999. It was the first balanced Federal budget in 30 years. In FY99, revenues were 1.82 trillion dollars. Spending was 1.70 trillion dollars, the surplus was $124 billion, and the GDP was 9.2 trillion. The 2004 United States Federal Budget began as a proposal by President George W. Bush to fund government operations for October 1, 2003 – September 30, 2004. The requested budget was submitted to the 108th Congress on February 3, 2003. The 2006 United States Federal Budget began as a proposal by President George W. Bush to fund government operations for October 1, 2005 – September 30, 2006. The requested budget was submitted to the 109th Congress on February 7, 2005.The government was initially funded through a series of three temporary continuing resolutions. Final funding for the government was enacted as several appropriations bills enacted between August 2 and December 30, 2005. As of 2018, this is the last fiscal year to be funded without the use of an omnibus spending bill or full-year continuing resolution. The budget of the United States government for fiscal year 2007 was produced through a budget process involving both the legislative and executive branches of the federal government. While the Congress has the constitutional "power of the purse," the President and his appointees play a major role in budget deliberations. Since 1976, the federal fiscal year has started on October 1 of each year. The government was initially funded through a series of three temporary continuing resolutions. Final funding for the Department of Defense was enacted on September 29, 2006 as part of the Department of Defense Appropriations Act, 2007, while the Department of Homeland Security was funded through the Department of Homeland Security Appropriations Act, 2007, enacted on October 4, 2006. The remaining departments and agencies were funded as part of a full-year continuing resolution, the Revised Continuing Appropriations Resolution, 2007, on February 15, 2007. The 2008 United States Federal Budget began as a proposal by President George W. Bush to fund government operations for October 1, 2007 – September 30, 2008. The requested budget was submitted to the 110th Congress on February 5, 2007.The government was initially funded through a series of four temporary continuing resolutions. Final funding for the Department of Defense was enacted on November 13, 2007 as part of the Department of Defense Appropriations Act, 2008, while the remaining departments and agencies were funded as part of an omnibus spending bill, the Consolidated Appropriations Act, 2008, on December 26, 2007. The United States federal budget for fiscal year 2009 began as a spending request submitted by President George W. Bush to the 110th Congress. The final resolution written and submitted by the 110th Congress to be forwarded to the President was approved by the House on June 5, 2008.The government was initially funded through three temporary continuing resolutions. Final funding for the Department of Defense, Department of Homeland Security, and Department of Veterans Affairs was enacted on September 30, 2008 as part of the Consolidated Security, Disaster Assistance, and Continuing Appropriations Act, 2009, while the remaining departments and agencies were funded as part of an omnibus spending bill, the Omnibus Appropriations Act, 2009, on March 10, 2009. The United States Federal Budget for Fiscal Year 2010, titled A New Era of Responsibility: Renewing America's Promise, is a spending request by President Barack Obama to fund government operations for October 2009–September 2010. Figures shown in the spending request do not reflect the actual appropriations for Fiscal Year 2010, which must be authorized by Congress. The government was initially funded through two temporary continuing resolutions. Final funding for the government was enacted as an omnibus spending bill, the Consolidated Appropriations Act, 2010, on December 16, 2009. The 2012 United States federal budget was the budget to fund government operations for the fiscal year 2012, which lasted from October 1, 2011 through September 30, 2012. The original spending request was issued by President Barack Obama in February 2011. That April, the Republican-held House of Representatives announced a competing plan, The Path to Prosperity, emboldened by a major victory in the 2010 Congressional elections associated with the Tea Party movement. The budget plans were both intended to focus on deficit reduction, but differed in their changes to taxation, entitlement programs, defense spending, and research funding.The House resolution did not pass the Senate, nor did the Senate pass a resolution of their own, so there was no 2012 budget of record. The actual appropriations bills for Fiscal Year 2012 included four continuing resolutions and three full-year appropriations bills enacted in November and December 2011, in accordance with the United States budget process. These appropriations were greatly affected by the Budget Control Act of 2011, passed in August 2011 as a resolution to the debt-ceiling crisis; it mandated budget cuts over a ten-year period beginning with Fiscal Year 2012. In addition, legislation was passed to extend a cut in the Social Security payroll tax for the entirety of calendar year 2012. The government was initially funded through five temporary continuing resolutions. Final funding for the government was enacted as an omnibus spending bill, the Consolidated Appropriations Act, 2012, on December 23, 2011. The 2013 United States federal budget is the budget to fund government operations for the fiscal year 2013, which is October 2012–September 2013. The original spending request was issued by President Barack Obama in February 2012.The Budget Control Act of 2011 mandates caps on discretionary spending, which under current law will be lowered beginning in January 2013 to remove $1.2 trillion of spending over the following ten years. In addition, several temporary tax cuts were scheduled to expire at the beginning of the 2013 calendar year, including the 2001 and 2003 Bush tax cuts on income, capital gains, and estate tax, which had been extended in a 2010 tax deal, as well as a payroll tax cut that began as a result of the 2010 deal and had been most recently extended in an early 2012 tax deal. The combination of sudden spending cuts and tax increases has led to concerns about significant negative effects on the economy in the wake of the weak recovery from the recession that began in 2007. The government was initially funded through a single temporary continuing resolution. Final funding for the government was enacted on March 26, 2013 as the Consolidated and Further Continuing Appropriations Act, 2013, which contained funding bills for the Department of Defense and Department of Veterans Affairs, with a full-year continuing resolution for all other departments and agencies. The 2014 United States federal budget is the budget to fund government operations for the fiscal year (FY) 2014, which began on October 1, 2013 and ended on September 30, 2014. President Obama submitted the FY2014 budget proposal on April 10, 2013, two months past the February 4 legal deadline due to negotiations over the United States fiscal cliff and implementation of the sequester cuts mandated by the Budget Control Act of 2011. The House of Representatives passed its proposal, H.Con.Res 25, prior to the submission of the President's budget proposal, as did the Senate (S.Con.Res 8). The House and Senate budget resolutions were not reconciled as a final budget.At the time the fiscal year 2014 budget was debated, budgeting issues were controversial. Government spending had recently been limited by an automatic sequestration process that resulted when Congress and President Obama failed to meet spending reduction targets set by the Budget Control Act of 2011. The House and Senate were at the time controlled by different parties with different fiscal agendas. Failure to pass an initial continuing resolution caused the federal government shutdown of 2013. The government was then funded through a series of two continuing resolutions. Final funding for the government was enacted as an omnibus spending bill, the Consolidated Appropriations Act, 2014, enacted on January 17, 2014. The United States Federal Budget for Fiscal Year 2016 began as a budget proposed by President Barack Obama to fund government operations for October 1, 2015 – September 30, 2016. The requested budget was submitted to the 114th Congress on February 2, 2015. The government was initially funded through a series of three temporary continuing resolutions. The final funding package was passed as an omnibus spending bill, the Consolidated Appropriations Act, 2016, enacted on December 18, 2015. The United States federal budget for fiscal year 2018, which ran from October 1, 2017 to September 30, 2018, was named America First: A Budget Blueprint to Make America Great Again. It was the first budget proposed by newly-elected President Donald Trump, submitted to the 115th Congress on March 16, 2017.The government was initially funded through a series of five temporary continuing resolutions. The final funding package was passed as an omnibus spending bill, the Consolidated Appropriations Act, 2018, enacted on March 23, 2018. The United States federal budget for fiscal year 2019 runs from October 1, 2018 to September 30, 2019. Five appropriations bills were passed in September 2018, the first time five bills had been enacted on time in 22 years, with the rest of the government being funded through a series of three continuing resolutions. A gap between the second and third of these led to the 2018–19 federal government shutdown. The remainder of government funding was enacted as an omnibus spending bill in February 2019.